Virginia Euwer Wolff is the winner of the 2011 Phoenix Award for her 1991 novel The Mozart Season. Her 2001 novel True Believer won the National Book Award and her newest novel for young adults, This Full House (2009), is on the American Library Association’s Amelia Bloomer List. Regarding her contribution to Our White House, Virginia Euwer Wolff writes: “I’ve lived in music for most of my life, so music in and around the White House was a natural choice,” writes Virginia Euwer Wolff. “I investigated the musical life of each presidential family from George Washington into the 21st century, and the months I spent working on the project were rewarding ones indeed. Musicians have enlivened the rooms of the White House for two centuries, and we’ve had very musical presidents, as well as ones who couldn’t hum a tune or distinguish between Beethoven and Johnny Cash. “The White House book contains one paragraph from my essay about music in the White House; it’s about President Taft, his violin, his pianist wife, the musical Marines, and some other guest performers. “My instrument is the violin. I’ve played since I was eight years old, with a gap in early adulthood when I rarely touched my violin. I’m older and wiser now, and I play nearly every day. I still take music lessons, I’m the second violinist in a piano quintet called Parnassius. I play in the Oregon Sinfonietta, and I usually say yes when people invite me to join a chamber group for an afternoon. One of the books listed below is about a musician. You’ll figure out which one. 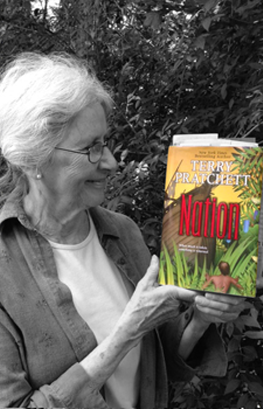 Author Virginia Euwer Wolff recommends Nation by Terry Pratchett (HarperCollins, 2008) as a Great Read for ages 12 and up. Check out more Great Reads on thencbla.org.